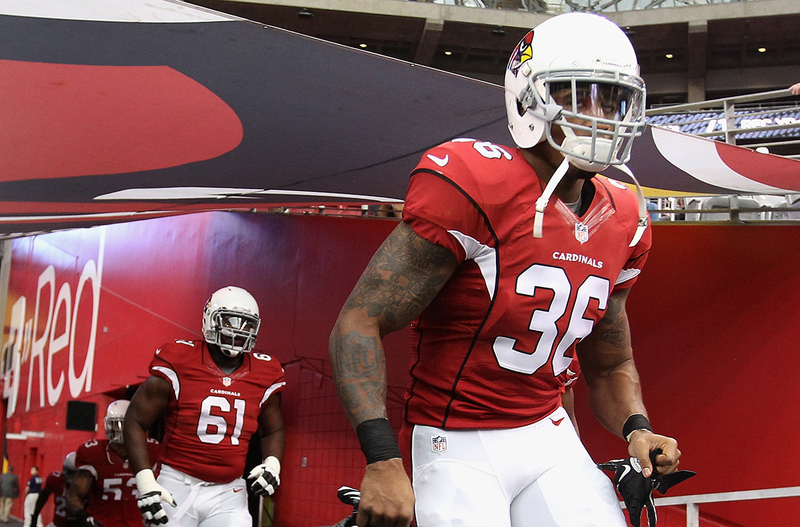 The Cardinals’ young and vicious secondary could challenge Seattle’s Legion of Boom. Attrition wears on every football team, but the stakes of battle came early for Steve Keim’s team this year. Last season, his first as the Cardinals’ general manager, Arizona won 10 games behind one of football’s scariest defenses. According to DVOA,1 only the Seahawks were better. 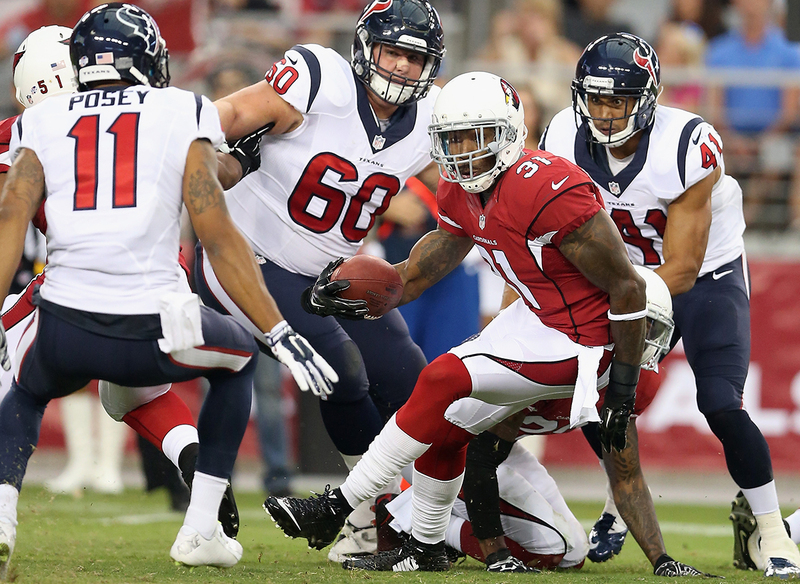 The Cardinals gave up the fewest rushing yards in the league — running against Arizona was like trying to dig out of a prison cell with a tablespoon. Football Outsiders’ team efficiency statistic, which is explained here. Eight months later, as Keim sat watching an August practice at the University of Phoenix Stadium, much of what made that defense so dominant had been downed or had disappeared. Outside linebacker Karlos Dansby, brought in on a one-year deal last season, turned an excellent 2013 into a four-year contract with the Browns. Daryl Washington, the team’s pass-rushing star inside linebacker, was suspended for the season after a series of positive drug tests. Talking draft philosophy that day, Keim made a point more prophetic than even he could know. “How many times is your need in May or April the same as it is in November or December?” he said. “Whether it’s arrests, suspensions, injuries, your needs are always changing.” A week later, Darnell Dockett — a stalwart Cardinals pass-rusher for a decade — would tear his ACL and be lost for the season. This is only Keim’s second year running the Cardinals, but it’s his 16th with the franchise. Keim played guard at NC State, and he still looks the part of an offensive lineman: shaved head, stern glower, imperceptible neck. He took the purest football route there is to running an NFL team — starting as an area scout before snagging promotions all the way to the top. Keim has been along for every step in building the Cardinals’ roster, which means he has also watched how the demands have changed, as the NFC West has transformed into the best division in football. He’s seen the 49ers and Seahawks construct perennial contenders, the type of teams that can keep a 10-6 Cardinals team out of the playoffs. And he’s watched as Seattle’s secondary has become an offense-shredding nightmare. Arizona’s front seven might be depleted, but Keim spent his offseason bolstering the back end of his defense. With all-world cornerback Patrick Peterson and budding star Tyrann Mathieu in place, the Cardinals added Antonio Cromartie to their group of cornerbacks. A month later, Keim took earthshaking safety Deone Bucannon with the 27th pick in the 2014 draft. Seattle might have the Legion of Boom, but Arizona has the No Fly Zone. And it just may be the future of the Cardinals franchise. “We’re playing with the big boys,” Keim says of life in the NFC West. “This is bring your A-game each week. Amid all the change sits one of the surest things in football. 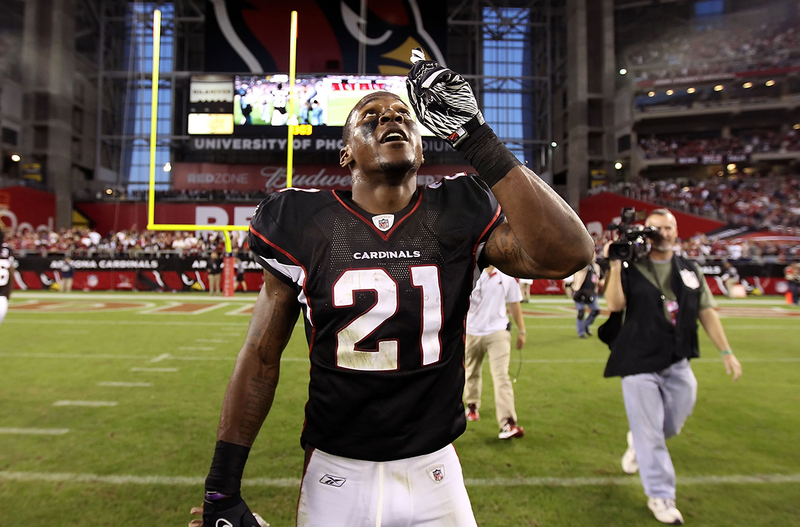 Patrick Peterson arrived in Arizona as the fifth overall pick, and he has played like it from the start. No defense handled no. 1 receivers as well as the Cardinals did a year ago, and that’s Peterson’s doing. When the Cardinals made Peterson the richest cornerback ever with a $70 million extension back in July, there was no celebratory splurging. “I was a first-rounder,” he says, “so I had a couple dollars. I pretty much have everything I want.” Peterson wears his superstardom well. He knows when and how to flash that perfect smile. He’s been lugging the “franchise cornerstone” load for years, ever since going so high in the loaded 2011 draft, and it has never looked too heavy. Being a wunderkind is one thing, but the circled entry on Peterson’s wish list arrived the day he signed the contract. His $48 million guaranteed — $8 million more than the Seahawks gave Richard Sherman in May — affirmed Peterson’s status as the best corner alive. Peterson never had to tell his agent, Joel Segal, that that was the goal; Segal already knew. After Sherman’s deal was announced in May, Peterson said he was worth more, and the Peterson-Sherman debate has raged ever since. It reignited last week, when Sherman didn’t see a single pass thrown his way against the Packers. Because Sherman plays only the left side of Seattle’s defense, Green Bay left Jarrett Boykin there all night, prompting people such as Hines Ward to ask why the league’s best cornerback would spend an entire game dealing with a no. 3 receiver. The Sherman contract played a role in Keim’s offer to Peterson, but there were a few complicating factors. “The biggest obstacle was that we were the first team to give out an extension from the new CBA,” Keim says, alluding to Peterson being the first player extended from the 2011 draft class. “Pat’s deal wasn’t the same as Richard Sherman’s. [Sherman and Joe Haden] had one year left on their contracts, and Pat technically had two.” There were some “natural obstacles,” Keim says, but it was a deal the Cardinals were intent on getting done. His birthday is July 11. Physically, Peterson was always in a rare class. Built like a strong safety but faster than most cornerbacks, Peterson looks like a defensive back built in a lab and sent here from the future.3 “When we got him at first, he was a great press cover man,” Keim says. “Now, he’s becoming more of a student of the game. He understands how to play off man coverage, and spacing and concepts. He has really gotten to be a true pro.” According to Arizona cornerbacks coach Kevin Ross, if Peterson has a weakness, it’s that he plays so much man coverage that at times — Ross stresses at times — he gets locked on to a particular receiver in zone coverage. Last season was the worst of Cromartie’s career, and at 30, his price tag for 2014 was about $15 million. That didn’t include the $5 million roster bonus he was due in late March. So on March 9, the Jets released Cromartie, nearly four years to the day after they traded a second-round pick to the Chargers to get him. As Cromartie surveyed his options, he identified Arizona — offering only a one-year, $3.5 million deal — as the best place to prove his worth again. He had two-year offers from other teams, but signing for just one with the Cardinals was a chance to show that 2013 was the exception. It’s a similar situation to Karlos Dansby’s with the Cardinals a year ago. Arizona’s system was almost identical to the one Cromartie ran with the Jets, and Cromartie worked with Ross, the cornerbacks coach, for two seasons during his time in San Diego. About two miles from the Cardinals’ Tempe facility sits a Fleming’s steak house, where Keim takes visiting draft prospects. For Tyrann Mathieu, it was an ideal spot. “I’m a steak guy,” Mathieu says. So Mathieu flew to Arizona, threw on a polo shirt and jeans, and rode nervously to dinner. “Obviously, I thought they were going to grill me and interrogate me,” Mathieu says. “But it was the total opposite.” Along with a few defensive coaches, Keim had brought his son. “His son knew everything about me,” Mathieu says. “He just knew everything about everybody, from Pat [Peterson] to Larry [Fitzgerald] — he couldn’t have been no more than 9 years old.” Keim’s son was 8. 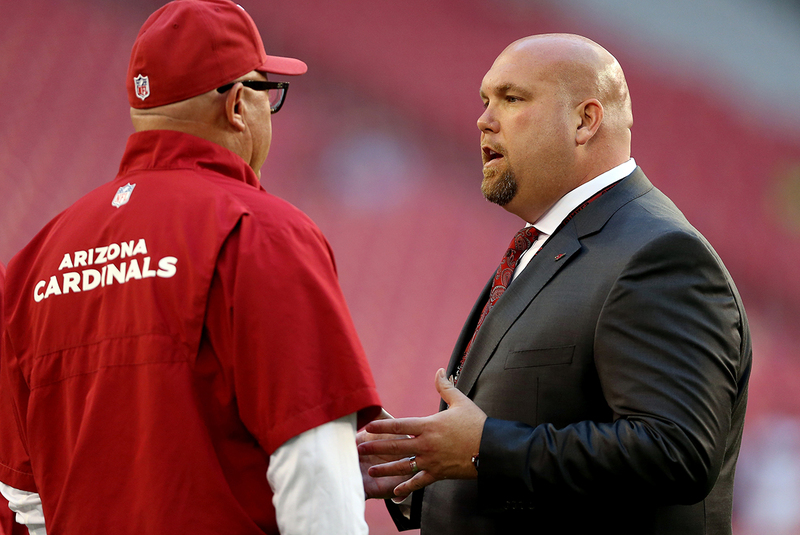 Every general manager has to weigh “character concerns” — Keim has his own approach. There are some players whose tendency toward self-destruction will never fade. But there are others, Keim says, who can latch on to a team with players like Fitzgerald or Peterson and steer out of the fog. “At the end of the day, the difference between those guys and the other ones are the ones who love the game,” Keim says. “If you love the game and you’re passionate about football, and that’s all you have, you have a chance. It was enough for Keim to take the risk, and he took it at the point teams typically do — further down the draft. Safeties coach Nick Rapone says Arizona had Mathieu “earmarked” for the third round, and there he was, with the 69th pick. “Quite frankly,” Keim says, “he may be our best tackler.” When Mathieu tore two ligaments in his knee against the Rams, he tried to run off the field. Mathieu’s knack for finding plays looks innate, even preternatural, but listening to him talk about watching practice provides some insight into how he does it. It’s a thirst. Arizona’s defense is designed to give Mathieu chances to create the game-altering plays he finds so easily. For the past few months, those chances have gone elsewhere. “That’s the hardest part, seeing other guys make plays and not being out there to contribute. 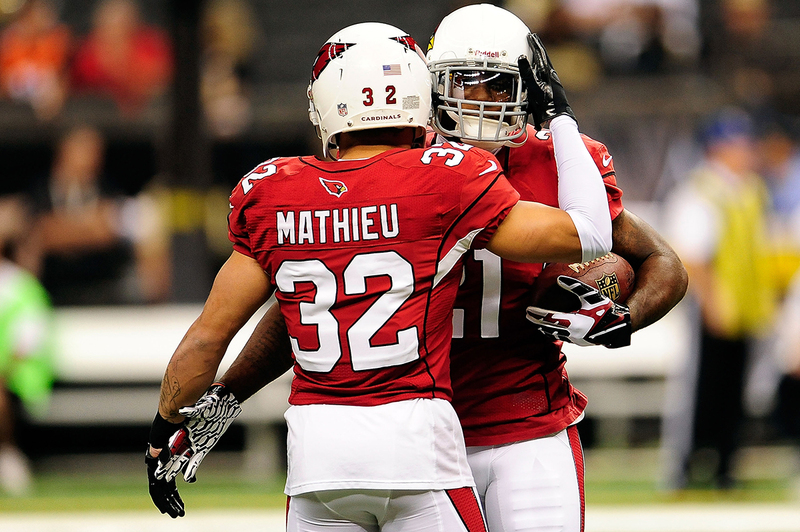 I’m itching to hit somebody, to get my hands on the ball,” Mathieu says. About midway through the third quarter, Auburn was up four and again threatening to score. On second-and-7, running back Corey Grant got the ball on an end around off the right side. As he got to the hashmark, Grant put his right foot into the ground and hit an alley up the field — an alley that closed quickly. “He had nowhere else to go but straight,” Bucannon says. “It was just me and him, and who wanted it more.” Grant was stopped cold, the ball sent flying. The next day, during the team’s film session, Washington State’s coaches played the hit over and over — seven or eight times, Bucannon guesses — each time to cheers. What Keim saw in Bucannon was his effect on the rest of Arizona’s secondary, how he fit with everything the Cardinals already had. “What we were missing was a big, physical, downhill safety,” Keim says. The Honey Badger and the Hammer won’t be standing next to each other when the Cardinals take the field tonight. Bucannon is still working his way into the base defense, where 2013 undrafted free agent Tony Jefferson is slated to start. Jefferson’s ability to step in and play as a rookie last year is just another argument for why Arizona’s secondary has a chance to turn the corner this year. Even if Bucannon eventually takes over, Jefferson and Jerraud Powers are starting-caliber players who give Arizona both depth and flexibility. For now, Bucannon is spending much of his time as a linebacker in the Cardinals’ dime packages. If Arizona had a shortcoming on defense a year ago, Keim says, it was an inability to slow down opposing tight ends. With Bucannon playing linebacker on downs, the Cardinals have an extra defensive back to combat that problem as well as their lack of depth at inside linebacker. Covering tight ends is an added benefit, but Bucannon knows what he was brought here to do. “He’s an intimidator,” Keim says. It’s a reputation Bucannon relishes, but he wants to take it even further. The past six months have seen massive contracts handed out to the league’s best cover men. Piecing together an all-time great secondary was the start, but the Seahawks also knew that keeping it together could be the difference between one Super Bowl and three. Jairus Byrd got $28 million guaranteed from the Saints; Joe Haden got a five-year, $68 million deal extension in Cleveland. A quality secondary is worth the investment — a notion Keim has shown he believes more than once this offseason.